A Mayo Clinic study says the best training for adults is high-intensity aerobic exercise, which they believe can reverse some cellular aspects of aging. High-intensity intervals also improved muscle protein content, which enhanced energetic functions and also caused muscle enlargement, especially in older adults. 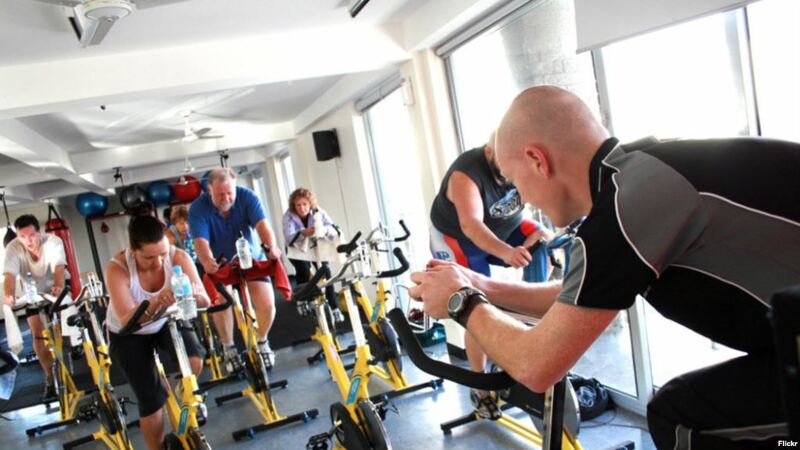 The researchers said exercise training significantly enhanced the cellular machinery responsible for making new proteins. That contributes to protein synthesis, thus reversing a major adverse effect of aging. “We encourage everyone to exercise regularly, but the take-home message for aging adults is that supervised high-intensity training is probably best, because, both metabolically and at the molecular level, it confers the most benefits,” says K. Sreekumaran Nair, M.D., Ph.D., a Mayo Clinic endocrinologist and senior researcher on the study. He says the high-intensity training reversed some manifestations of aging in the body’s protein function, but noted that increasing muscle strength requires resistance training a couple of days a week. Cardio respiratory health, muscle mass, and insulin sensitivity improved with all training. Mitochondrial cellular function declined with age but improved with training. Increase in muscle strength occurred only modestly with high-intensity interval training, but occurred with resistance training alone or when added to the aerobic training. Exercise improves skeletal muscle gene expression independent of age. Exercise substantially enhanced the ribosomal proteins responsible for synthesizing new proteins, which is mainly responsible for enhanced mitochondrial function. Training has no significant effect on skeletal muscle DNA epigenetic changes but promotes skeletal muscle protein expression with maximum effect in older adults. The research findings appear in Cell Metabolism. The research was supported by the National Institutes of Health, Mayo Clinic, the Robert and Arlene Kogod Center on Aging, and the Murdock-Dole Professorship. The molecular transducers of benefits from different exercise modalities remain incompletely defined. Here we report that 12 weeks of high-intensity aerobic interval (HIIT), resistance (RT), and combined exercise training enhanced insulin sensitivity and lean mass, but only HIIT and combined training improved aerobic capacity and skeletal muscle mitochondrial respiration. HIIT revealed a more robust increase in gene transcripts than other exercise modalities, particularly in older adults, although little overlap with corresponding individual protein abundance was noted. 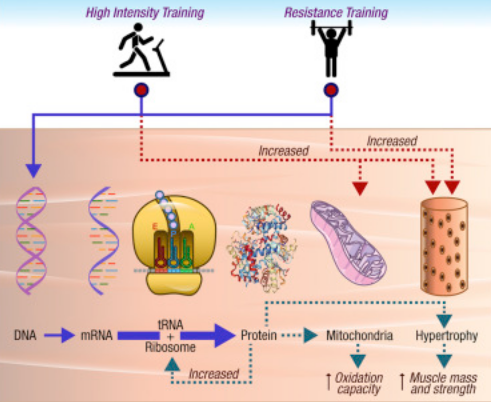 HIIT reversed many age-related differences in the proteome, particularly of mitochondrial proteins in concert with increased mitochondrial protein synthesis. Both RT and HIIT enhanced proteins involved in translational machinery irrespective of age. Only small changes of methylation of DNA promoter regions were observed. We provide evidence for predominant exercise regulation at the translational level, enhancing translational capacity and proteome abundance to explain phenotypic gains in muscle mitochondrial function and hypertrophy in all ages.